ALAMO — The Lady Muckers failed to keep their three game conference winning streak alive against Pahranagat Valley Panthers last Friday away. The Panthers were by far the hardest opponent played to date. They lost in Alamo by a score of 61-27, but fell fighting. 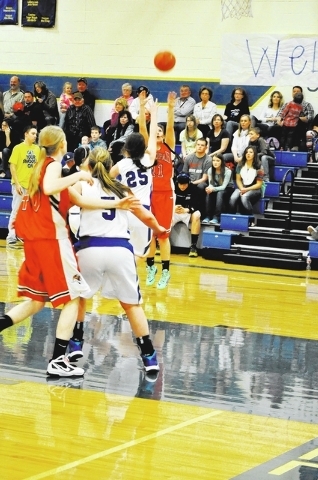 Pahranagat Valley was a very disciplined team with an overall record of 16-4 and 4-0 in conference. The Muckers now find themselves in second place with a 3-1 record and tied with Beatty for second place. Muckers Coach Russell Olin knows his girls are up against some stiff competition in the near future as the season winds down and he knows he will have to go through Pahranagat Valley to get to state. “In League, they have been tough. They do not have a weak spot,” he said. 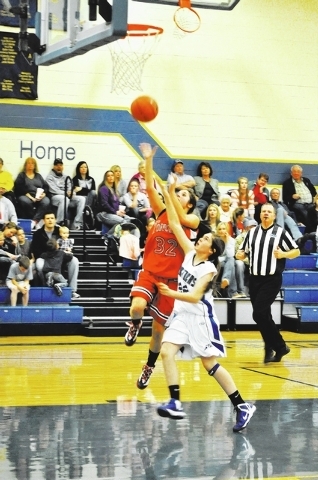 “Alamo is quick and fast and has excellent three point shooters. They also have a well-balanced team,” he said. According to the coach, the team’s main problem against the Panthers was the defense. PVHS relied on two great shooters that led their team to the victory. Freshman Kalli Hosier was the leading scorer with 20 points and Traci Strong also had a strong shooting game adding 18 more points. For the Muckers, Julia Klapper and Ashley Gray performed well against the Pahranagat Valley defense. Klapper had 13 points and 6 rebounds while Gray had 12 rebounds and scored 7 points. Olin believes he has a good inside game, which his team benefited against the Beatty Hornets, but against the Panthers it was nonexistent. “This time we didn’t get the ball inside enough. We also missed some shots inside,” Olin said. In addition to a stiff defense by the Panthers, the Muckers also had to battle themselves. Fatigue was a big factor in the game in the last quarter. “The girls hustled the whole game. We were short handed, and they were tired at games end,” Olin explained. of Life (0-8, 0-3 in League) that will be on Friday in Las Vegas. “We will be working on moving our feet on defense. We also need to understand that when the other team runs with the ball, that sometimes we will be guarding a different person than assigned. On offense, we need to move the ball faster, and to get it inside more,” the coach said after the Alamo’s game.